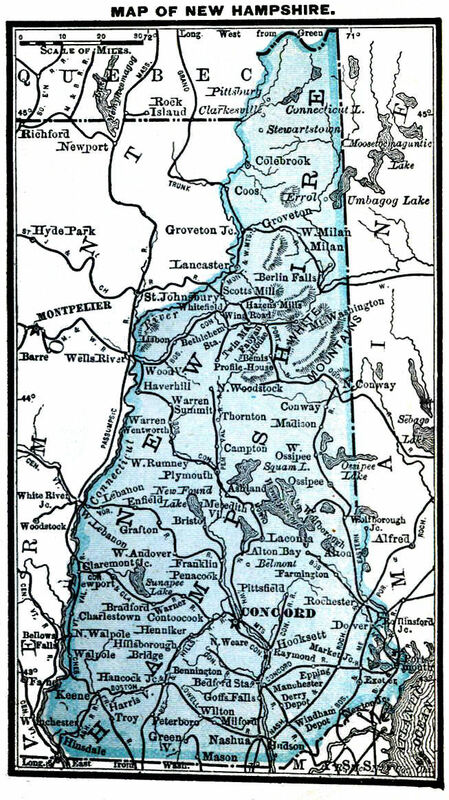 In Wentworth, NH, there’s Rocky Pond and Rooky Brook — which is it?? I’d have to guess Rocky, unless the brook is a green newbie – heh. I wonder if these neighbors had a good laugh on that one! Now THESE two neighbors had no idea at the time! His name, of course, being something like Alexander Melvin Fogg, as these maps mainly used initials for first and middle names. I couldn’t find his brother Xavier Hale anywhere in Westmoreland, NH – har, har, har! B. Sharpe and D. Flatt can’t be far behind! Dr. John! Wright Place, Rong Time! In about 25 years, this would’ve been an awkward neighborhood. And a tip of the hat to Mr. Stanley above these two, whose Steamer was around just a few years prior to these two familiar nameplates. To the left, there’s “Hon. J. Jonson Fam”, which I’m assuming to be “family”, but what’s that to the right? Same thing, but followed by some garbled abbreviations. Summer residence?? If so, does the family cross the street in the summer to live there? That would be silly. But I need to KNOW these things!!! 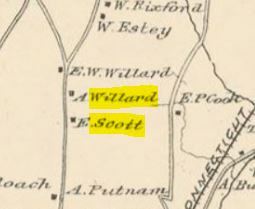 The first question I had was “What is South Stoddard, NH doing in northeast Stoddard?! 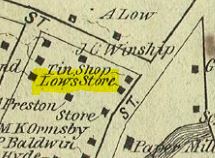 ?” That is, until I saw the NORTH arrow below the map. Ahhhhhhhhhhh. 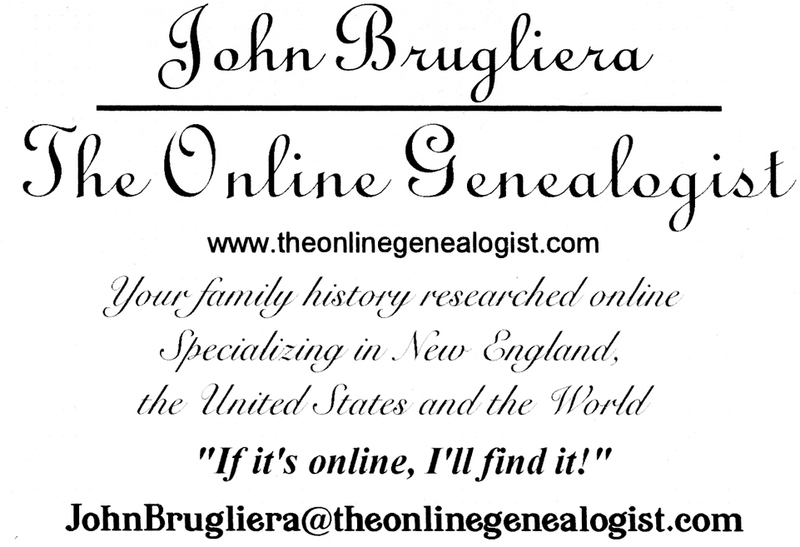 And if you’re having trouble finding your way through your family history, hire ME – The Online Genealogist!! 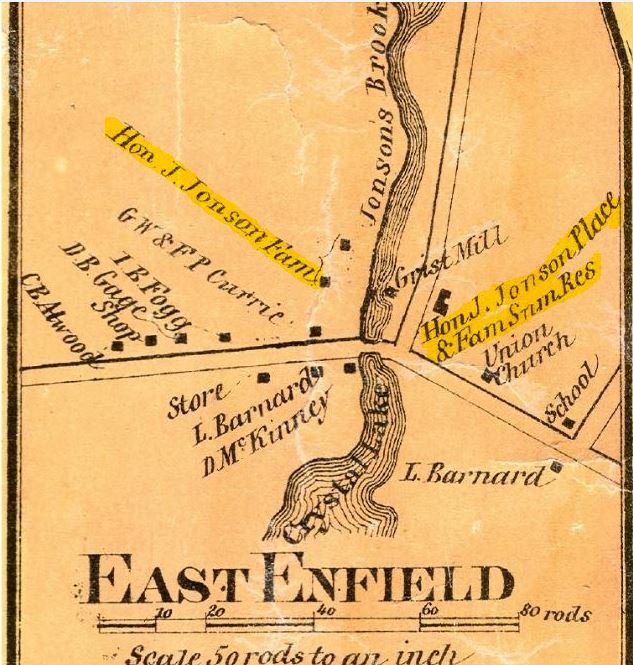 In the East Enfield map I think the “Hon” prefix might symbolize “Honary,” as in the honary judge whatever. Thre is a map if Southern Maine that looks just like that with the individual family names listed. It’s from 1871 and the library of Congress houses an online version. I wonder if the maps were comissioned for a specific reason?